NASA's Messenger spacecraft found this funny crater on Mercury, during its close approach flyby on January 14th, 2008. Note the phone shape inside the crater. In all seriousness, however, this telephone shape is actually a collapsed lava tube, a remnant from Mercury's more volcanic days. What you have noticed in this Mercury image is *extremely* important. Within the context of the conventional theories, it is rather meaningless. But within plasma-based cosmologies, the curled shape is indicative of an excavation resulting from a plasma discharge impacting upon the planet Mercury. What happens to plasmas within the laboratory is that they tend to formulate filaments. Due to their electromagnetic properties (plasmas are essentially ionized gases), these filaments possess both long-range attraction and short-range repulsion. That means that they naturally form rope-like structures. You can observe this in action on a novelty plasma globe. Look carefully at where the filaments touch the glass and you'll notice that what appears as one single filament is in fact two twisted together. You can tell because they separate at the glass. What you are observing here is something that has been observed on other planets like Mars. Conventional astrophysicists have no convincing explanation for it because they assume that bodies in space cannot acquire and trade electrical charge (the lava tube explanation is rather weakly supported by the image details). Within the Electric Universe, the universe is not an electrically closed system and planets can and do trade charge during violent interactions. Craters can be the result of plasma discharges in addition to volcanic activity or impacts. In this particular case, it appears that the rotation of the Birkeland Current was cut off mid-stroke before it could complete a full rotation. 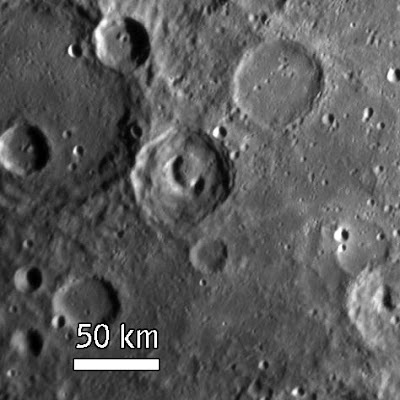 You will notice that other craters on various planets have terraced edges. This is because in those instances, numerous rotations were achieved. The conventional theories have difficulty explaining those features as well. I highly recommend that you read Don Scott's "The Electric Sky" or visit the Thunderbolts website and forums. You will be rather surprised by what you find if you are able to suspend your disbelief long enough to understand what is being said. Coming from an EE background (like myself), you are uniquely positioned to see the inherent logic of it all too. It appears that there is a new cosmology on the scene that's doing a pretty darned good job of explaining the things we're seeing in our local neighborhood! And the best part is that we can learn quite a bit about the universe in a plasma laboratory! Thanks for the commentary! This is certainly an interesting theory, and I've been looking at some stuff on it. In regards to suspending disbeliefs, as Carl Sagan wrote, it is a scientist/engineer's duty to maintain an open mind, yet remain skeptical at all times. I'm going to put The Electric Sky on my reading list, and check out the Thunderbolts site you mentioned. Definitely fantastic write-up along with the presented good expertise. My business is and so fascinated to learn to read this post. At this point simply click here payday loans spring-valley Appreciate it ones write-up presented good expertise. zeker, ik krijg hier veel nieuwe dingen te horen. Bedankt!